America’s pastime tells us much about America’s past. 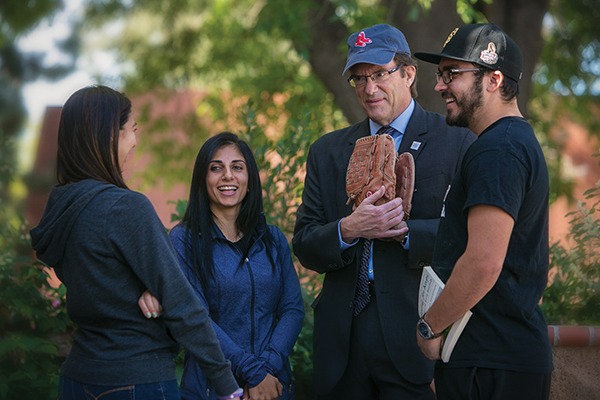 So much so that Cal Lutheran president and baseball fan-in-chief Chris Kimball introduced a history course on the national game for the spring 2016 semester. As it turns out, what happened on the diamond reflects the forces shaping the country and even reveals a few inconvenient national truths. “I try to make it clear we are not going to talk about players and stats. It’s more about what the game can tell us about America,” said Kimball, a University of Chicago–educated U.S. historian. Kimball lists urban history, race and labor relations, gender roles, imperialism and globalization as major themes in the curriculum of the undergraduate honors course he teaches on the Thousand Oaks campus. At 7:45 on a chilly February morning, Kimball leads off with a review of the previous class, tossing out questions like high pop-ups for students to field. They talk about the pivotal 1888 gathering at Delmonico’s Restaurant, where the sport’s boosters drove home the idea that baseball was an American invention. Guests such as Teddy Roosevelt and Mark Twain were instructed, through chants of “no rounders,” to pay no attention to baseball’s resemblance to the English schoolchild’s bat-and-ball game called rounders. When Kimball surveyed his students, he was surprised to discover how few counted themselves close followers of the big leagues. One player from the Regals softball squad is in the class, and no baseball players. “If you asked me to write down everything I know about baseball, it would be the Baby Ruth candy bar and the Great Depression,” said senior Kevin Kunes, a “radio and multimedia guy” who carries a ukulele. An avid Boston Red Sox fan since childhood, Kimball is philosophical about this generation’s curbed enthusiasm. “Tastes change. All sports come and go. Boxing and horse racing used to be more popular,” he said. With the course in its early innings, it was clear Kimball planned to use his historian’s tools to explode myths about the game. “I will do what I can to put the final nails in the Doubleday theory’s coffin,” he said, alluding to the man once credited with drawing up the game of baseball in bucolic Cooperstown, New York. A handpicked commission intent on proving baseball was born in the USA promoted the legend. Kimball points out that Abner Doubleday, who achieved fame as a Civil War officer, never spoke of inventing the sport in his encounters with others or in his personal correspondence. To make matters worse for those who’d like to think of baseball as the pastoral game in the movie Field of Dreams, evidence points to its being an urban game, honed in the streets of Brooklyn and Manhattan. As the course goes forward, Kimball will also make the case that today’s major leaguers are no greedier or more disloyal than storied players of the past. Senior Tina Abbaszadeh found herself questioning the early hype around the game and the insistence on its U.S. origins. “Why is it patriotic to pick on a British kids’ game?” the political science and communication major asked. In the early baseball clubs, complex class relations were played out. The clubs attracted young men who aspired to the middle class and sought to be seen as upstanding citizens. Feeling their jobs threatened by mechanization, clerks and artisans formed clubs for support and for what we now call networking. Early organizers emphasized the game’s “manly” values. A man was characterized by control of his body and emotions. “Players high-fiving, fist-pumping and chest-bumping would not have played well in that era,” Kimball told his class. Rules evolved to separate the men from the boys. Early on, the batter was called out when a fielder caught a ball after one bounce, rather than only on the fly. “It was all about making the game more physically challenging, more manly,” Kimball said. The racial divide was vast. African-Americans fielded early teams in handsome uniforms and walked on accompanied by fife and drum corps. A small number played alongside whites in the big leagues of the 1880s. Then came the Jim Crow era. Blacks and whites would not play in the same uniform again until Jackie Robinson integrated the game in 1947. “Learning history through baseball is an interesting hook,” said Michaela Crawford Reaves, the History Department chair. Looking over Kimball’s course synopsis, Reaves could relate it to her family’s American experience. “For me it harkens back to my grandfather who played semipro ball. It was about scrappy immigrants becoming part of the American tapestry,” she said. The added workload of teaching doesn’t bother Kimball. On a good day, balancing it with his duties as president feels like executing a triple play.